The daytime TV magic is real. Ever since I attended a “The Late Show with Stephen Colbert” taping in March, I get promo emails from the PR company that books the audience tickets for many television tapings. I never look in my Promotions folder, but when I saw the subject line, “NEW dates released for The Chew, Seth Meyers, The View, & more!”, I suddenly could not look away. I saw the click-through option in the email to apply for tickets to a taping of ABC’s “The View.” I immediately filled out my information. If this was an identity theft scam, I would have 100% fallen for it all for the chance to see these fabulous ladies yell at each other about current events in person. I grew up in a family unable to afford summer camp, so my babysitter was daytime TV. I watched every talk show religiously and I could still tell you the basic trajectory of any current celebrity’s career based solely on my memories of their press tours every summer. I was fully plugged-in during the famously tumultuous Rosie/Hasselbeck years. It was part of my routine. My days went like this: Wake up. 10 A.M. — “Today” show, 11 A.M. — switch between “The View” and “The Price is Right,” 12 P.M. — local news, 12:30 P.M. — back to bed for a nap. That time in my life was pretty great. 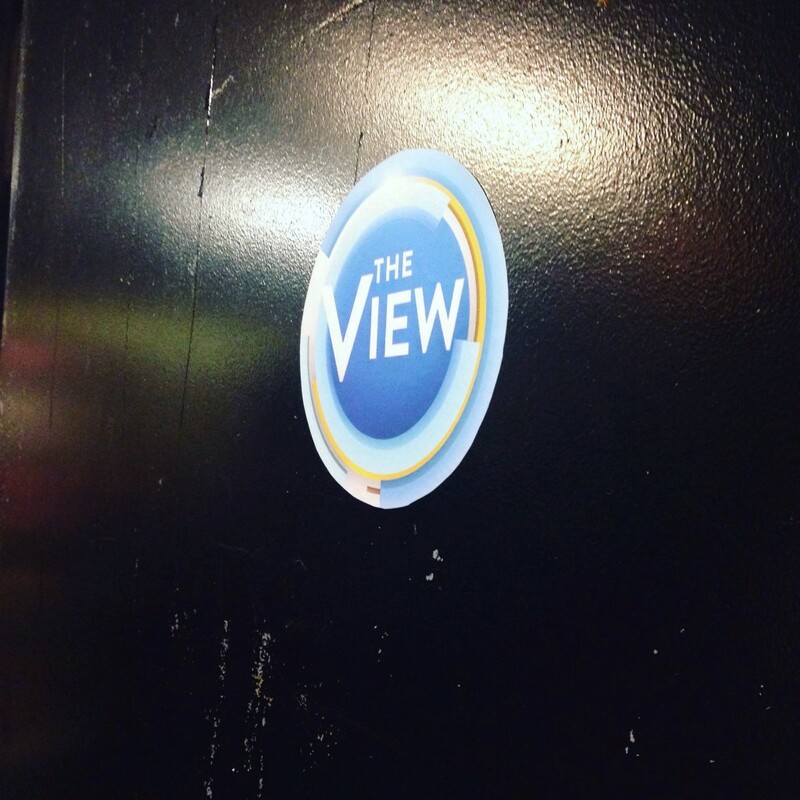 These days, it’s not really a prime display of feminism to say that you enjoy “The View,” but I was genuinely very into this show as a preteen, and I could not deny that entering this process — however reluctant my jaded adult world lens tried to make me feel about it — was a genuine full circle moment. I so clearly remember eating lime-flavored popsicles in the summertime and checking the Info Guide to see who the beloved talk show guest would be to help me kick off my relaxing summer day. I was quickly confirmed for tickets, and a few days later the guest name appeared on my ticketing dashboard. DANIEL RADCLIFFE, TUESDAY JULY 19TH. Boy oh boy. The universe’s timing is perfect. I am 24 years old. The perfect age to have adored and grown up with Harry Potter, and yet somehow I completely missed it. I never read the books or saw the films as they were released. I still don’t know how it ends (I’m on The Order of the Phoenix right now. Don’t tell me anything!) I decided this summer to start reading the books in order with a fresh “adult” perspective. And I love them. A lot. Hufflepuff for life. I’ve also been catching up on the films as I finish each book. Mr. Radcliffe happens to be on my mind VERY MUCH recently. I brought one of my best gal pals and we hopped in line around 11 A.M. on our big morning. (Sorry to crush anybody’s dreams, but this was a pre-tape for an episode that will air in mid-August. Magic isn’t real.) 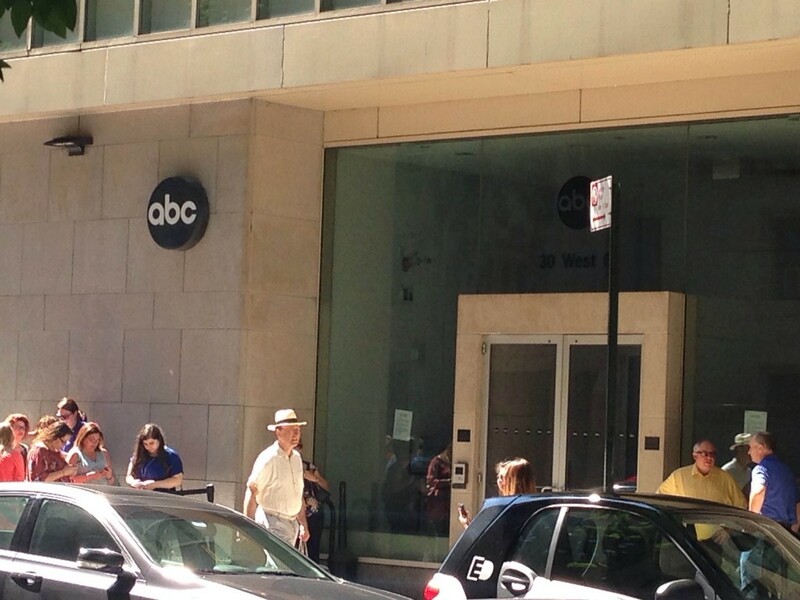 We stood outside of the ABC building on West 67th Street as the sun beat down on us. We were surrounded by all kinds of people. Some seemed to be what I had expected the core demo to be for “The View” — out-of-town tourists over age 50. But there was also a sizable contingent of young women who live in New York, just like my friend and I. Radcliffe brings in the ladies. I did some eye-rolling at the conversation topics of the girls behind me, who were perfectly done up in jewel-toned summer dresses and chunky necklaces. I heard sentences like, “If we don’t go to trivia tonight we can watch Pretty Little Liars!” and “I’m literally MELTING out here.” and “I’ve stolen a few,” referring to the rules of whether women are allowed to date friends’ exes or not. I wanted to dislike them right off the bat. But then I thought to myself, No. 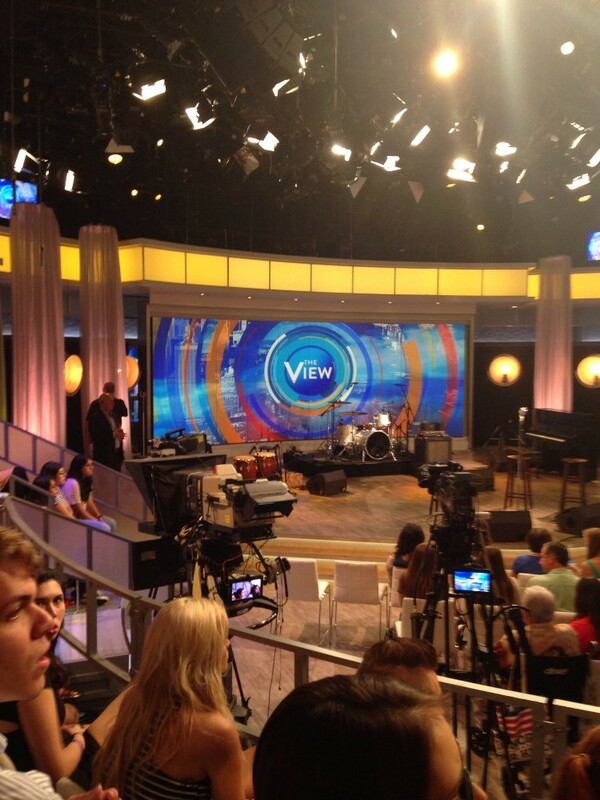 That’s not what “The View” is about. We are in this together. Entering the studio; sound stages are always incredibly exciting for me. That joy came to a temporary end when we met our warm-up comic, however. I may be biased, because I have never liked any warm-up comic I’ve ever had the displeasure of enduring. I just don’t dig what they’re up to. They’re pandering, they’re crass, they’re condescending, and it’s always a creepy old white man. If the primary aim of their job is to keep our energy up, they can just blast some ’90s boy band music and everyone would be fine. They taped the show backwards (once again, magic is not real) so we kicked off our show with Leslie Odom Jr.’s (of Tony-winning Hamilton fame) musical performance. It was phenomenal. They even did the whole “the audience is going home with a free copy of his CD” thing, which was genuinely cool and fulfilled an Oprah-induced childhood wish of getting free stuff on TV. After Leslie’s wonderful performance, they set-changed and I eagerly awaited the Holy Grail of women’s television — the half-circle table at which the ladies chat. As it was wheeled out, a lump rose in my throat. My childhood summers flashed before my eyes. The ladies trotted out one by one, all looking stunning, and Whoopi continued to be my idol in her IDGAF Crocs. Then, the moment came. They brought out Daniel Radcliffe. Radcliffe was simply irresistible: some slight stubble, a perfect gray summer suit, and those bright blue eyes that you could stare into for days. He told charming stories about his girlfriend and discussed his film coming out in August, Imperium. During a cut to “commercial,” he was trotted around the studio by PAs for various online content photo ops. He was effusively kind to every audience member who interacted with him and he did not seem the least bit bothered by what is now almost two decades of screaming girls accosting him. I was certainly a Radcliffe fan before, but consider me OBSESSED at this point. Is my entire YouTube history for the past 48 hours just Daniel Radcliffe content? Maybe. Yes. I went to this taping with the notion that I would be snarkily scoffing at everything in sight and laughing about how ridiculous women’s media has become in 2016. 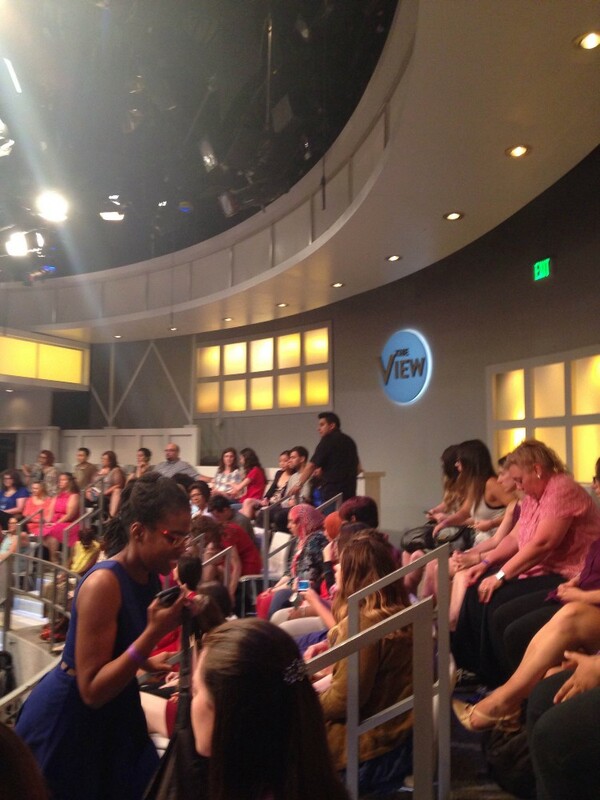 But the people who work on “The View” are very good at what they do. After all, the show is coming up on its 20-year anniversary; it is a well-oiled machine at this point. After another commercial break, the “Hot Topics” segment began and the hosts had a very pleasant and interesting discourse. They playfully argued about the idea of have a marriage counselor live in your home with you, and whether fighting is an essential part of marriage or not. Some opted to tell more serious stories about their own relationships and fighting habits while Joy Behar talked about how adorable and kind her husband is, and how they never fight. I love her. I did not think this was possible, but I came away from this experience an even bigger fan of Joy Behar than I was before. She is the glue that keeps that show together. She calls out the crazies, she keeps the conversation moving, and her self-deprecating style makes the topic at hand relatable and light, whereas some of the other ladies mistake any new topic as an opportunity to make it about themselves in a very self-aggrandizing and overdramatic way. The latter is certainly what gets ratings, but Behar is the rock of hilarity and kindness that makes “The View” something I’ve genuinely liked all these years, and not the entity that I anticipated mocking. Maybe I was wrong; maybe the magic is real. Is Hogwarts accepting applications?